Solar Micro Grids - generating attractive investor returns ! Micro grids can reduce gaps in energy-poor areas: CSE Energy experts of the Centre for Science and Environment (CSE) at a workshop mentioned that Micro grids based on renewable energy, which will allow decentralised generation of power for clusters of villages, could fill the energy gap in rural India. At present, a population of 300 million, nearly a fourth of the country, has no access to electricity. Over 800 million cook on biomass and suffer from indoor pollution. Nearly 45 per cent of all rural households have no electricity and depend on kerosene for lighting.The CSE suggested that while the choice of technology could be left to the developer, in the grid-connected villages, mini grids will act like a franchise to the electricity distributor. The consumer can pay the tariff of conventional energy and the difference can be paid as feed-in tariff by the discoms. The money for the feed-in tariff can come from sources like the National Clean Energy Fund, this is the tariff model suggested by officials. The only problem with this approach is that while there is discussion on mini grids, and larger grids ( 10-100 KWp) capacity, and integration with conventional grid, it will be slow implementation. Pico Grids ( or micro grids) in the range of 1-2KWp are quicker to implement, can be replicated, and go where there may be no conventional grid available in the 3-5 km radius as well. More importantly, there are perfectly feasible and economically viable. The other problem is the inefficiency of distribution. According to a recent report by World Bank ( More Power to India ; The Challenge of Electricity Distribution), 20 % of electricity is not paid for by consumers. A key factor outside the distributors’ control is that they are not fully reimbursed for the high costs of setting up rural power lines and supplying below-cost power to farmers and rural users. Although distributors are mandated to do this by the government, there is often a large gap between the payments due to them from the state and the amount they actually receive. We now look to large FIs, and investor bodies to come forward and fund part of this grid, in the process generating decent returns ( 8-12% p.a). Payback periods in most grids is less than 4 years. Now if that is not attractive enough - what is ? NDMC to adopt solar in a big way ...! New Delhi Municipal Council (NDMC) will appoint an operator to identify, design, erect, install, test, and commission rooftop solar units as defined by the Union Ministry of New and Renewable Energy. After the installation of the solar rooftops, New Delhi would become the second solar city in the country after Chandigarh. NDMC has identified 40 buildings in the area under its jurisdiction for installation of rooftop solar panels, its chairperson Jalaj Shrivastava has said. It will save NDMC from taking formal permissions at different levels while implementing this project.NDMC expects to generate almost 8MW rooftop solar energy within a year. According to an MoU signed between NDMC and Solar Energy Corporation of India (SECI), the civic body should meet at least five per cent of its total energy consumption needs through solar energy. As per estimate, the NDMC area consumes a daily 350 MVA electricity during summer and 150 MVA during winter. Apart from this the civic body is also contributing 16MW of electricity to 8,000 households in the city by generating power using solid waste as fuel at a 'Waste To Energy' plant on NDMC land in Okhla. One question remains - if the New Delhi streetlights come under the NDMC purview, would solar streetlights help save energy, and add to the quote of solar power generation as mandated for NDMC ? This has twin benefits - generation of power, and helping keep the roads lit up even when grid electricity fails ( which now is happening at regular periodicity) is one. 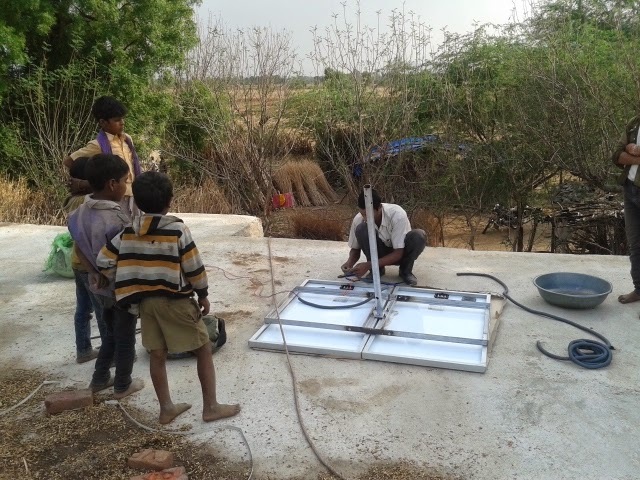 The other is what we believe is 'solar technology visibility' for the common man to see. We believe that we are at the threshold of a strong revolution that is brewing. And solar technology adoption is going to skyrocket. What needs to be done is popularise its usage and have enough working prototypes available for people to see and learn from. The Indian Railways is planning to generate 1 MW solar power at the New Delhi railway station by installing solar panels on the platform roofs. It would be implemented on a public-private partnership model was a part of the railways' initiative to convert some of its stations into "green buildings". It will be developed as per RESCO model in which an agency develops whole infrastructure and client pays the cost of electricity consumed per unit. The New Delhi railway station is spread over an area of the 6,38,467 square metre, including the yard area. About 4,21,388 square metre of the total is built-up area. The station has 16 platforms. Once operational, about 25 per cent of the energy requirements at the New Delhi station can be met by solar power, which has an average daily demand of over 4 MW. This is way above the utilities are mandated to generate as milestones fixed. The Railway officials said that once the pilot project at the New Delhi station becomes successful, it would have a model that could be replicated at other stations in the city viz.,Bijwasan, Old Delhi, Nizamuddin, and Anand Vihar. One wonders, why it needs to stop there and replicate this in other smaller railway stations. One risk is of pilferage and maintaining the systems in smaller locations such as Tier 2/3 towns and cities in India and the Indian Railways decides to go solar in such locations. Priority needs to be accorded to locations where grid power is erratic and in short supply. West Bengal Renewable Energy Development Agency (WBREDA) is taking up the work on installation of 10 kilo watt plants on the rooftops of school buildings as an initiative to supply electricity to 100 schools across the State by setting up solar plants. This 3 cr. project will start with a few schools in every district. WBREDA has been the nodal agency to set up alternative and renewable energy units in the State.